There are some foods that just make you warm all over, and eating them feels like getting a hug from the inside out. The cold, dark, and rainy (or snowy!) days of winter beg for food like this. Stews, roasts, and crock-pot dinners that cook for hours filling the house with an aroma that makes the whole neighborhood hungry. There are so many variations on this theme out there but if I want to get back to basic with that home-cooked, love-filled meal it has to be Chicken Pot Pie. Growing up, my mom made a wonderful chicken pot pie filled with garden grown veggies and usually topped with a whole wheat crust. I still love my mom’s chicken pot pie, but there is something about mastering your own version that is very fulfilling. I’ve made and adapted it so many times I really don’t even need the recipe anymore. I think each time I make it its a little different, I may tweak it a bit or absently minded add the milk before the broth, but without fail every time it is lick-the-bowl good. 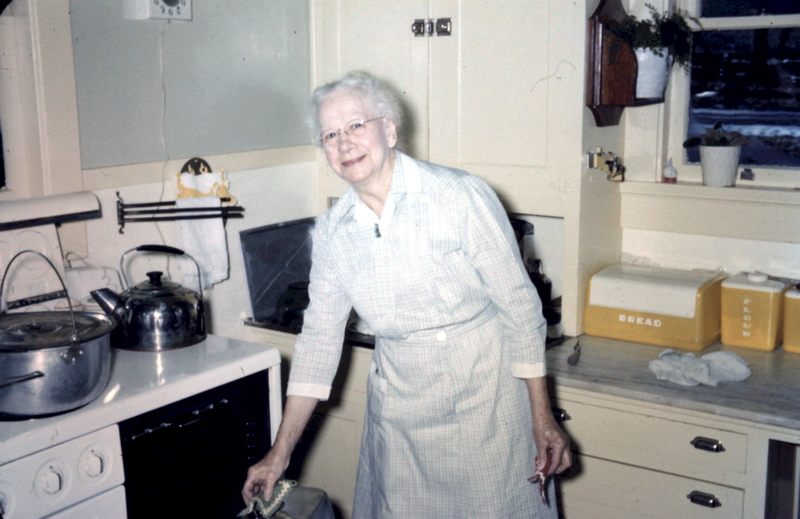 This is a photo taken with a slide camera in the 1950’s of my great-great grandmother in her kitchen in southern Ohio. I would give anything to try her chicken pot pie! Chicken pot pie is one of those recipes that everyone loves. When I eat it, I think about all of the mothers, grandmothers, and wives who have made it for their families over the years. Each women, with her own version yet somehow we are all connected through the flakey crust and tender veggies. To me, cooking is an activity that comes from the heart. I show my love with food, and it make me so happy to cook for someone. I don’t think it has to be fancy, intricate, or elaborate. It doesn’t need multiple courses and forgetting dessert is okay. Cook what tastes good, cook what you want to eat. Enjoying the company and conversation over a home-cooked meal makes everything taste better. Perhaps that is what I love about this blog; I can share my favorite recipes with you and it feels like I am in way cooking dinner for people I’ve never met and we can share a meal together. So, find some people you love and cook them these chicken pot pies and perhaps we can each find a little moment of calm and comfort this week. My parents came over for dinner on the spur of the moment last week so I decided to make individual pot pies for something different. You could of course make one in a large casserole dish. Because I was in a rush, I also used a grocery store rotisserie chicken. It turned out great, but I’m glad I thought to dial back the salt because they tend to be more salty than home-baked chicken. You could brown boneless and skinless chicken breasts in the skillet then once the sauce has been made right after you add the carrots, simmer the chicken breasts to cook through before adding the veggies if you wanted, or you could use left over chicken which is what I usually do. A good crust is key for pot pie. I prefer my go-to Vodka pie crust, but go with what you know and love. There are so many ways to adapt this for your personal tastes and timeframe so feel free to take liberties and use this recipe as a guideline. I’m sure your grandmother would be proud! Heat oven to 400°. Melt butter in large skillet. Add onion and celery, cook until the onion is softened, about 10 minutes. Add the flour and mix until incorporated stirring constantly until almost starting to brown and you notice a sweet nutty aroma. Add sherry or white wine to deglaze the pan. Then slowly, while whisking, add 2 cups of chicken broth. Mix the broth and flour mixture completely, trying to avoid lumping. Once the broth is fully incorporated and the lumps have been whisked out, slowly add the milk. Add the carrots and thyme. cook until almost tender. Add the peas and other veggies. We like a veggie heavy pot pie. Add the chicken, nutmeg and salt and pepper to taste. Cook until everything is heated through and the sauce is thickened slightly. Add additional broth if your sauce needs thinning. 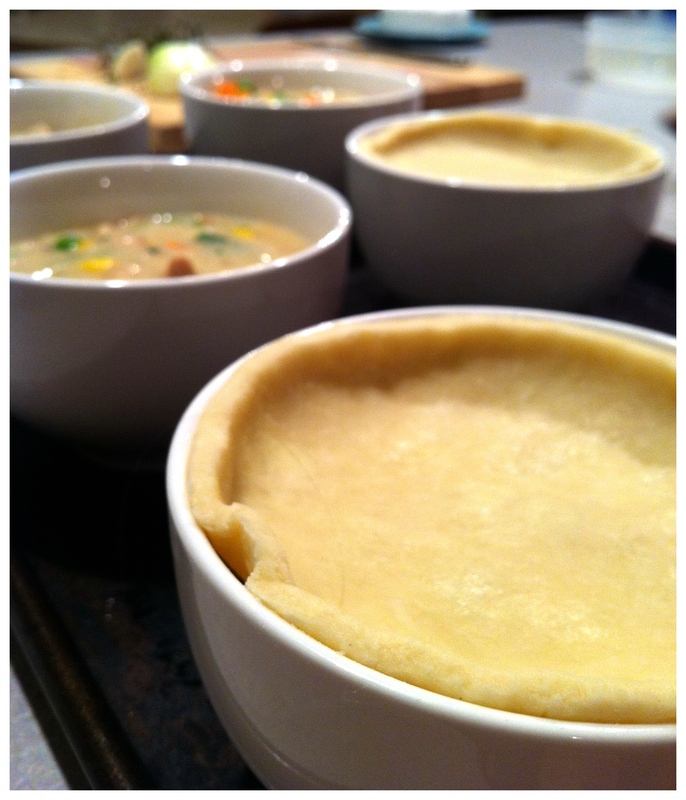 Divide filling among oven safe ramekins or bowls (or add to a casserole dish). Top with pie crusts, cutting slits for ventilation. Brush the pie crust with a couple of tablespoons of cream and bake at 400° for 25-30 minutes or until the pie crust is cooked and nicely browned. Allow to cool slightly before serving. This entry was posted in Comfort Food, entree, poutry, Recipe, Winter and tagged Comfort Food, Poultry, Recipe. Bookmark the permalink. I really enjoyed this post. Love pot pies and I love thinking of my grandmothers cooking even more.